ARCO Construction Company Recently Completed a Training Facility for Budrovich | ARCO Construction Company, Inc.
ARCO Construction Company recently completed a tenant improvement of a 28,400 square foot warehouse/office/conference room and event facility. 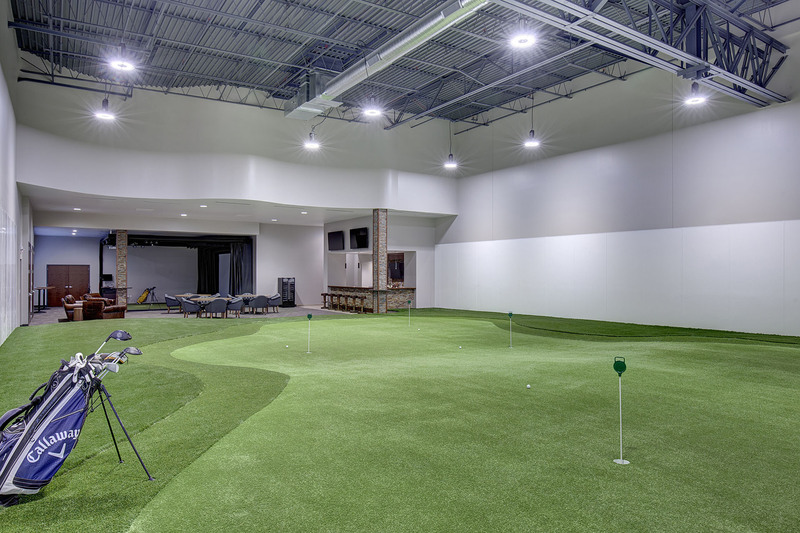 This unique project consisted of the coordination and installation of a indoor putting green and driving range simulator. The golf areas also included detailed low voltage audio visual systems, high end interior bar finishes and large curved soffits and curbs for the putting green space. ARCO reinforced and removed large openings in the existing concrete tilt panels and relocated structural columns for larger clear spans to accommodate the project. The conference/event space contains two projectors with detailed low voltage and audio visual systems for training as well as a high end bar and prep space. ARCO also completed a large parking lot expansion and installed an elevator shaft for future expansion on the existing mezzanine. ARCO aims to make the construction process both enjoyable and beneficial for our clients and to exceed expectations through successful planning, design and construction. Budrovich is St. Louis contractor that specializes in crane rental, excavation site utilities, land development, marine and mechanical insulation. The company has been around since 1945 and has grown significantly into the business it is today. It is run by the third Budrovich generation and strives to create good relationships with their customers, and employees.